As opposed to the Netlink, it's is actually based on the slower RCV144ACFW-P chipset(14400 bps maximum). It also has some additional hardware to handle smart cards, and two leds at the top to show some kind of status. The cart itself is about an inch wider and 1/4" thicker than the Netlink. It was bundled with an internet browser called "Sega Saturn Internet Vol. 1"(which looks oddly enough like a japanified Planetweb), some other disc called "Pad Nifty", and an X-Band version of the game "Virtua Fighter Remix". As opposed to the Netlink, it's is actually based on the slower RCV144ACFW-P chipset(14400 bps maximum). 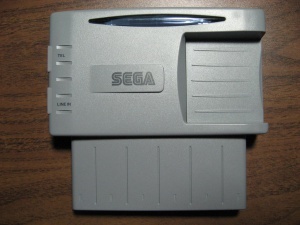 It also has some additional hardware to handle smart cards, 128 kb of flash ram, and two leds at the top to show some kind of status. The cart itself is about an inch wider and 1/4" thicker than the Netlink. It was bundled with an internet browser called "Sega Saturn Internet Vol. 1"(which looks oddly enough like a japanified Planetweb), some other disc called "Pad Nifty", and an X-Band version of the game "Virtua Fighter Remix".